Visual impairments are common in people with learning disabilities, but identification, treatment and care can be difficult. Learning disabilities health professionals who have been trained as vision champions can ensure that the vision needs of their clients are being supported and met. This service evaluation aimed to learn about post-training outcomes for vision champions in their work teams and for their clients with learning disabilities. 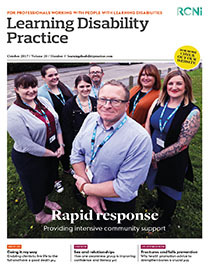 Vision champion training was delivered to ten community learning disabilities healthcare professionals and, three months later, training outcomes were evaluated with qualitative interviews. Vision champion training increased the professionals’ confidence and efficacy in their abilities to assess and meet the vision needs of their clients with learning disabilities. The training enabled the professionals to create more vision-friendly environments for their clients. The champion role can be effective in meeting the health needs of clients. Further development of the champion role and its evaluation are recommended.